Israel’s Mission to the UN hosts special forum celebrating 70 years of Israeli civil society innovation and contributions to the world. 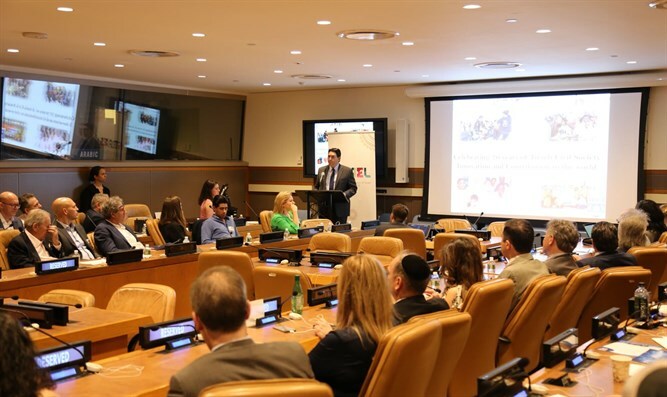 Israel’s Mission to the United Nations hosted a special forum celebrating seventy years of Israeli civil society innovation and their contributions to the world. Ambassador Danny Danon opened the event with celebratory remarks. The forum featured presentations from four Israeli NGOs that are bettering the world. Among the participating organizations were Save a Child’s Heart, an NGO dedicated to improving pediatric cardiac care for children in developing countries; ZAKA, which provides lifesaving search and rescue assistance to mass casualty emergencies worldwide; Innovation Africa, a non-profit using solar energy to provide clean water, light and refrigeration for vaccines and medication to schools, orphanages and medical clinics; and ISRAID, Israel’s life-saving disaster relief organization that offers long-term support for refugees. “As we mark seventy years since the founding of the State of Israel, we recall with great pride our country’s commitment to helping others live a better life. We have committed ourselves to this cause since the birth of our state,” Ambassador Danon said in opening the event. “We recognize these organizations valuable contribution to the work of the UN and the realization of its 2030 Agenda and the Sustainable Development Goals,” Ambassador Danon said.